Snorkeling Poipu Beach Park is popular and the beach offers all the facilities needed for hanging out on a beach for hours. The snorkeling is decent, but crowded. It is just to the right of the tombolo (described below) out to the island. The other areas are generally too wavy for fun snorkeling here. 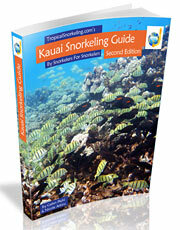 Note: This page is a sample from our popular Kauai Snorkeling Guide eBook available here. 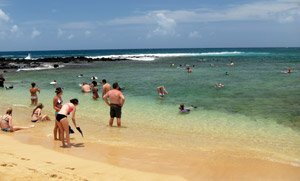 In the summer though Hawaii often gets a southern swell that can make this a dangerous place to snorkel, so check condition reports or ask the lifeguard if you aren’t sure. The geology is pretty unique at Po'ipu Beach. Po’ipu has a tiny island off the beach that is connected with a sand spit. This formation is called a tombolo. There are only a few places in the world where this occurs naturally (although it is not completely natural here anymore). The sandy area that connects the beach with the island protects the right side from the waves that come from the trade-winds. Sand is periodically brought in to restore the tombolo. 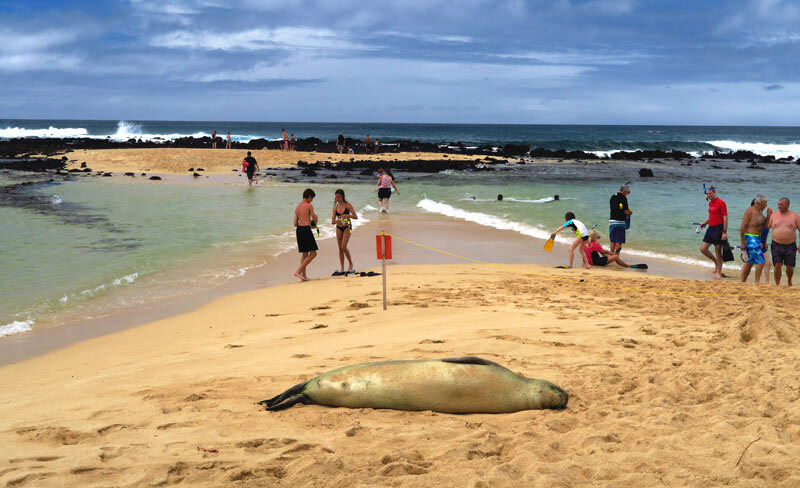 Poipu is also a popular spot for the endangered Hawaiian Monk Seals to rest on the beach. If you see one, give them lots of room because they are tired, and because there is a hefty fine for disturbing them. 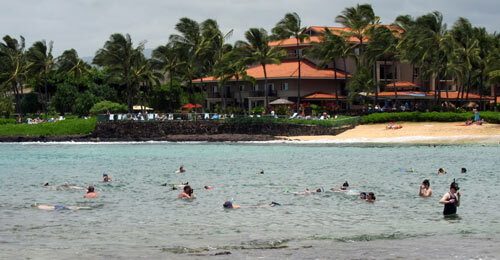 The far right end of the beach is fronted by the Marriott’s Waiohai Beach Club Resort. Enter from the beach on the right side of the tombolo. There is some coral shelf pretty close to the water’s edge that you should be aware of, but it is possible with bare feet. If you want to feel completely safe, wear some footwear. The snorkeling area is small here. It is between the beach and where the waves are breaking off the right end of the island. And it goes from the tombolo out into the little bay about a quarter length of the beach. There are some fish to see and we have seen turtles here frequently. 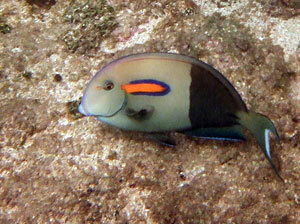 The underwater topography is flat and uninteresting, but there are a few colorful little corals to see. The visibility is not great snorkeling Po'ipu Beach Park, especially close to the beach, but as you get closer to the island you will find it improves some. The depths are no more than 10 feet through this area, so a good shallow spot. 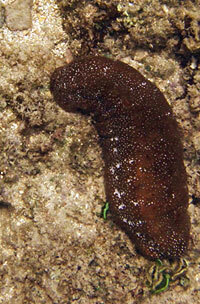 The reef here has sea cucumbers in residence. We frequently see turtles at Po’ipu Beach. 1. From Hwy 50 (Kaumuali’i Hwy) head south on Hwy 520 (Maluhia Road). 2. Turn left on Ala Kinoiki (Koloa-Po’ipu Bypass). 3. At the end of Ala Kinoiki turn right on Po’ipu Road heading west. 4. Watch for the sign for Hoowili Road on the left and turn there. At the end of this road is Po’ipu Beach Park. Parking is on both the east and west sides of Hoowili at the intersection with Hoone Road. 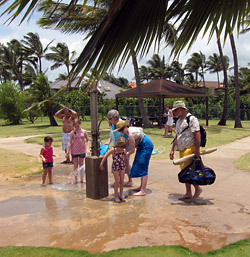 Poipu Beach Park has restrooms, drinking water, showers, a lifeguard, pavilions, picnic tables, barbecues, and shade.